In this article, we’ll be talking about the 5 best pond liners that you can use for your garden pond. However, firstly we’re going to talk a little about pond liners, the different types, materials and sizes that you might find, and which one is suitable for certain types of usage. Either way, we’re sure that you’ll be confident knowing which pond liner is suitable for your specific needs after reading this article. How to protect my Pond Fish and plants? In Conclusion, which is the best Pond Liner? Pond Liners are water-tight, impervious geomembranes which are used for the reservation and withholding of water in a public or garden pond. 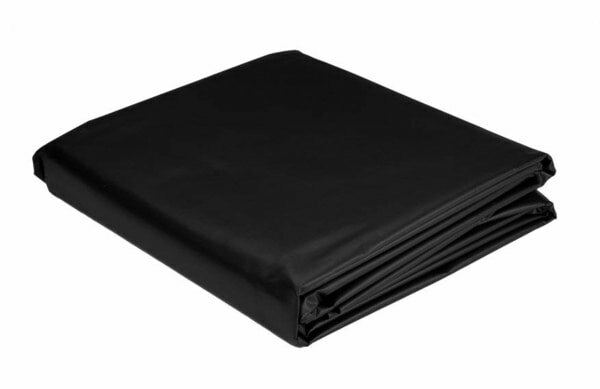 They are commonly used and placed over an underlayment, helping to prevent damage and keep the geomembrane in optimum condition. Highly flexible, therefore suitable for very compact shaping, versatile for 90-degree angles. Slightly softer than RPE liner, and requires pond underlayment to be installed before placing. Although once pond underlayment is installed, this greatly compensates for the softer material density. Slightly stronger than EPDM liner, although this is not a general rule and may vary from brand to brand. Pond Liners are made in a range of different sizes to help accommodate for different tastes/requirements for their garden pond creation. They usually begin around 5 x 5 feet, but can be found leading all the way up to 35 x 35 feet. 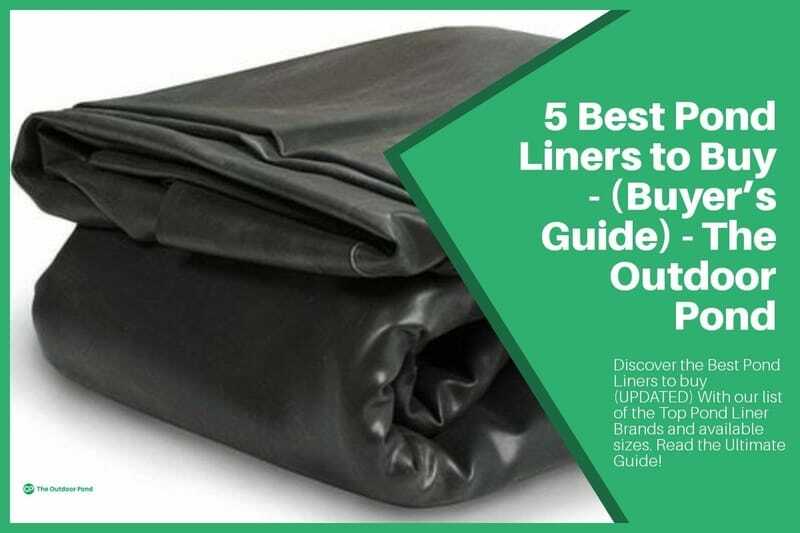 We’ve linked to all of the different sizes of pond liners that we’ve featured in this article, making the process quick and simple for those who know their liner size and dimension requirements. We’ve featured all of the necessary steps for you to take, to help ensure a successful liner installation; So let’s get to it! Do some research (potentially call your local council surrounding permission and whether or not there are pipes or obstructions below your garden, that would prevent you installing a pond. If everything is fine, get the appropriate equipment for your installation, this includes a rope, shovel, hose and a horizontal measuring leveller. Pick a level location in your garden where you would like your pond to be. 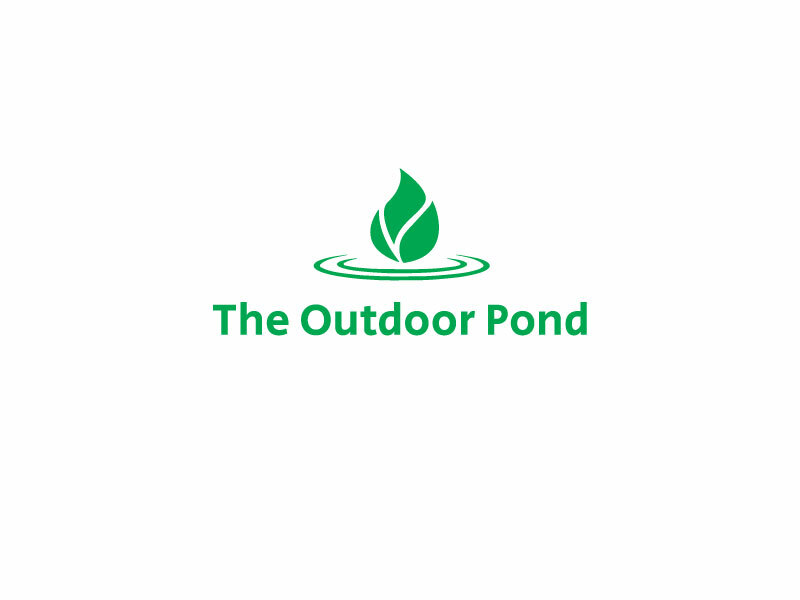 Bear in mind that a partially shaded location is more ideal, to help keep your fish cool and prevent the growth of algae within the pond; For more information on controlling pond algae, Check out our article on how to control algae in a pond. Design your water-garden on a detailed plan, with ideas about the size, shape and depth; The depth can be variable, with certain parts being deeper than others, although bear in mind that this will dictate the required liner size. Also, keep in mind that most ponds have plant shelves that are 9-12 inches in size. Place a layer (2-3 inches) of sand over this area of ground will ensure that necessary steps have been made to reduce the risk of the liner being damaged. Alternatively, you can use pond underlayment material instead of sand. Set the pond liner in the pond, and place some rounded rocks within the liner to keep it in place. If you’re adding a rock waterfall on the outside, you can add this now. Begin filling the pond with water, and smooth out the pond liner if any major material wrinkles start to form. Setup your pond pump, but do not plug in just yet (for solar pond pumps, place the UV panels out of direct sunlight for now), and either attach the outlet hose if you’re using it for your waterfall (Find best-selling Rock Waterfalls on Amazon), or attach the fountain head attachments which is usually included within the pump kit. As the pond is filled, use decorative rocks to place along the outside of the liner, helping to secure it’s position further. Then trim the excess pond liner. Plug in your pond pump to a GFCI-approved outdoor power outlet, or for solar pond pumps, place the UV panels in direct sunlight to begin the water flow and aeration. Add fish and aquatic plants to the pond if you so desire. An ideal alternative to using pond liner is to use a preformed pond. Preformed ponds are great because they allow for a consistent look without you having to sculpture your own pond yourself; Ideal for the aspiring pond owner who wants minimal installational hassle. Once you’ve placed your pond liner into the dug hole, and your water pump is working to oxygenate and aerate the water, you can then add your aquatic plants and fish. However, there are many threats that pond fish can face, especially from predators lurking up above. Therefore consider this when designing the pond; Having a shallow pond will make easy prey of your fish for birds, and sloping sides will also make easy prey for the likes of cats and foxes. Below, we’ve featured the 5 best pond liners. We’ve segmented them primarily based on the material type, and then sub-categorised them based on our editor’s recommendation and pricing; Making the process of choosing your ideal pond liner as simple and straightforward as possible. EPDM/Rubber liners are incredibly flexible, making them perfect for compact shaping at sharp angles (90-degrees). However, they are a little softer than RPE liners, and require underlayment or sand. All sizes are featured under the same Amazon listing, linked to above. 8 x 10 feet, 10 x 10 feet, 10 x 12 feet, 10 x 20 feet, 10 x 30 feet, 12 x 15 feet, 15 x 15 feet, 15 x 20 feet, 20 x 25 feet. Based on the 4.5/5 star reviews of this pond liner alone, it’s a fantastic option. 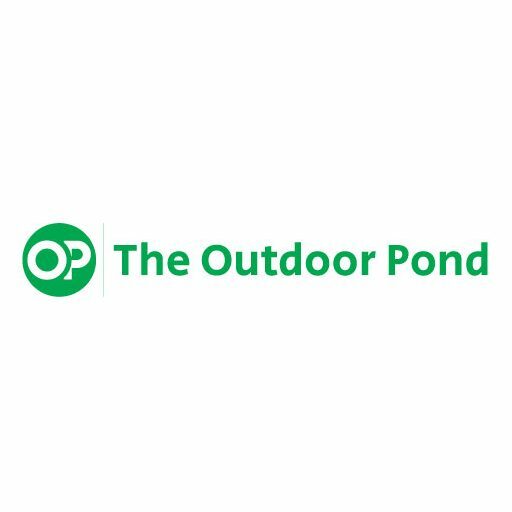 It comes in a huge range of sizes, is very easy to install, and the material is thick and highly flexible; All of this was taken from the comments, and they specifically tell you what sized pond liner the review is referring to. Resistance to solar UV radiation, oxidation and ozone. Aquascape has a full range of high-quality EPDM pond liners, all of which are backed by an exceptional, industry leading 20-year manufacturers guarantee… So you know full-well before buying any of Aquascape’s liners, that they are backing up their promise of high quality. The EPDM liners are naturally very flexible, but Aquascape’s liners are known for being especially reliable, easy to install and durable. All of their liners and underlayment are 45 millimetres in thickness and are fish/plant safe. For these reasons, this pond liner has to be one of the best products on the market. All sizes are featured under separate Amazon listings, all are linked to directly below. Based on the 5/5 star average reviews of this pond liner, for most sizes, it’s clear that it wins joint-first for our Editor’s Recommendation. Again, the Firestone Pondguard liner comes in a huge range of sizes, and is very easy to install. The material is thick, very durable, and highly flexible; All of these descriptions have been taken from the comments. Firestone has the largest size range of pond liners that we have seen; Making it easy for you to find the perfect liner for your pond. It has a 20-year pond liner warranty and an estimated lifespan of 75-years. Again, these EPDM liners are incredibly flexible, and the Firestone has been noted (in many of the Amazon reviews) to be incredibly strong and resilient… which is particularly important. We recommend that you also purchase an underlayment, or put a layer of sand below this liner, to further prevent any damage. 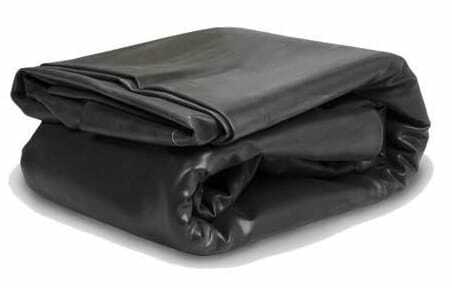 PVC liners are generally stronger than EPDM liners, but not as flexible. Therefore, if your pond is shaped with a nice rounded curvature and no sharp angles, a PVC liner may be more suitable. Based on the 4.0/5 star average reviews of this pond liner, it’s a popular PVC liner. However, there are mixed options about the strength of the material. 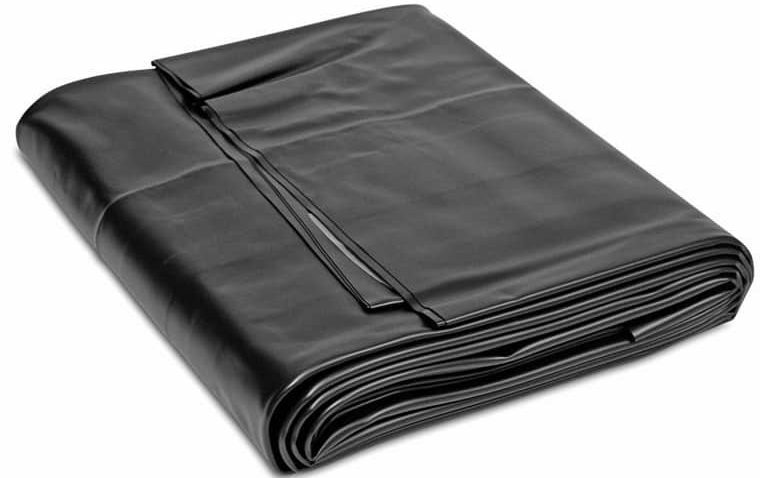 Totalpond has a small range of pond liners available, all of which are very inexpensive. Their range of liners are lightweight and easy to handle, being 14.5 millimetres in thickness. However, based on customer reviews, it’s clear that there are some who have complained about leaking. For us, despite the positive Amazon star rating, it’s clear there may be more reliable alternatives to which we have featured in the article. We cannot verify whether these reviews are all valid, with some pond owners being more vigilant than others, so please keep that in mind. Based on the 3.8/5 star average reviews of this pond liner, for most sizes, it’s certainly a great option. Pond Boss have a smaller range of sizes than other brands we’ve featured in this article. However, from reviews of these liners, for the most part, it’s apparent they are very sturdy considering their thickness, and the liner can take a lot of wear and tear without being damaged. 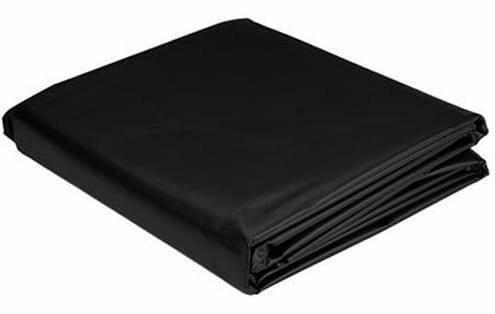 Pond Boss have a smaller range of pond liners, these have been developed with a lightweight, strong polyester weave, which is interwoven within the PVC. This means that it weighs 30% less than an ordinary 20-millimetre liner, whilst being just as strong. This PVC pond liner is environmentally friendly, non-toxic and features a textured surface in order to help promote positive bacteria growth; Helping create the right habitat for fish and plants. We also recommend that you also purchase an underlayment, or put a layer of sand, or soft fabric below this liner, to prevent any damage during installation. Based on the 4/5 star average reviews of this pond liner, for most sizes, it’s another great potential option. Similar to other PVC liners in this article, there are a limited number of size options available, but a broad range still. The majority of reviews on Amazon say that this brand of liner is highly flexible and thus easy to install, suitable for irregular shapes and angles, whilst being extremely tough and durable. 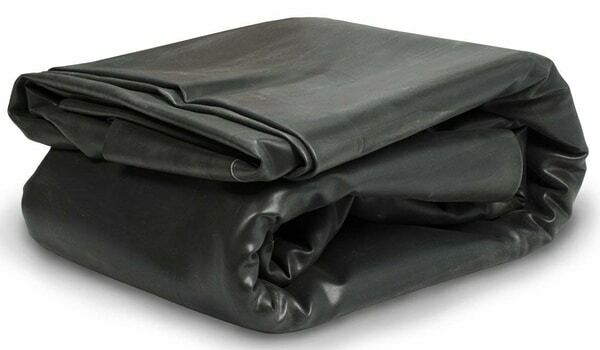 This PVC pond liner by the Beckett Corporation is the thickest PVC pond liner featured in this article; and thus is extremely strong, which may be ideal if you have uneven or naturally rough/rocky terrain. Even despite this 20-mil level of thickness, it is still incredibly flexible, which makes it a clear winner for us, regarding the PVC liners we’ve featured. Despite this, we always recommend that you install an underlayment, or put a layer of sand, or soft fabric below this liner, to prevent any damage during installation. We’re constantly trying to take into account customer reviews of each pond liner that we review, and hence our recommendations are heavily weighted towards the liner which has the best customer satisfaction rating. Therefore, without further ado, here are our recommendations. We hope that you’ve found our article on the best pond liners interesting and useful. If you have any more article or product review suggestions please contact us via our contact page.